Today, the University of California Board of Regents has taken an important step to ensure a healthy future for our state by officially approving the establishment of the Sue & Bill Gross School of Nursing at UCI. The regents’ approval underscores the pressing need for world-class education in nursing science. 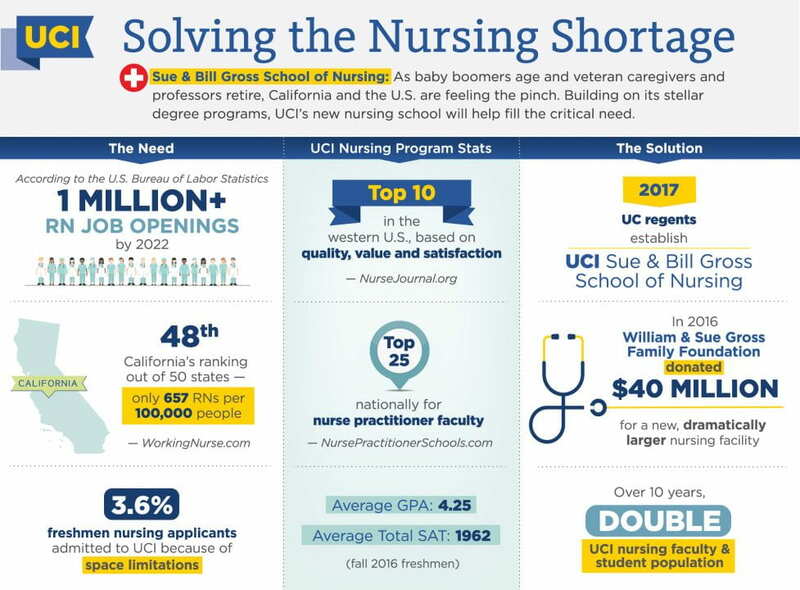 UCI is proud to serve as a training ground that will enrich the pipeline of prepared, skilled healthcare professionals who work locally and across the country. The nursing school would not be possible without the visionary support of the William & Sue Gross Family Foundation, which donated $40 million toward its creation in January 2016. The gift will help the university address critical healthcare concerns by substantially expanding our nursing education program and assisting in the construction of a new building to house the school. It also will aid in broadening our reach into the community to better meet the healthcare needs of underserved populations. Led by founding Dean Adeline “Adey” Nyamathi, the school is the fourth of its kind in the UC system. I encourage each of you to learn more about the exciting future and impact of the Sue & Bill Gross School of Nursing here. Please join me in celebrating this terrific milestone and reaffirming our thanks to the William & Sue Gross Family Foundation for its generous, longtime support of UCI’s health mission.